The Capri product line offers a unique, solid body, glass mosaic tile that is suitable for residential and commercial floor, wall and countertop installations. Capri is manufactured by grinding and pressing recycled glass creating a beautiful and extremely durable product suitable for heavy traffic environments. Capri is made using 95% post-consumer recycled glass content combined with an innovative, low energy production process. Available in solid colors and color blends, glossy finish or "grip" finish. The grip finish provides enhanced slip resistance in showers, pools and other wet environments. The Capri product combines unique style with exceptional technical performance to give you the ultimate in design flexibility. You can buy this product in our internet market. We will be glad if you make the right choice. First quality glass mosaic tile manufactured using 95% post-consumer recycled glass. 2 in. x 2 in. 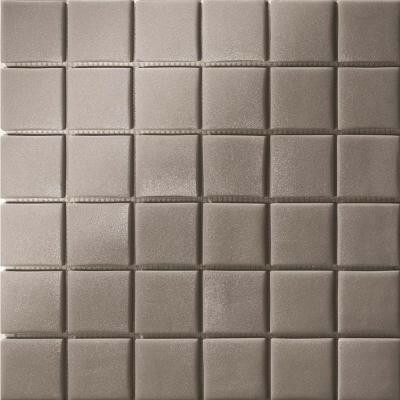 individual glass mosaic tiles mesh mounted on 12.5 in. x 12.5 in. x .25 in. sheet. Textured surface provides high level of slip resistance (.85 dry/.73 wet) for all applications including shower floors and pool decks. Highly resistant to abrasion and suitable for all residential and commercial applications including floor, wall and countertop installations.